The title and publisher's imprint of this map appear at the top right, facing an explanatory note at top left. Squares, open spaces and the built-up area in the city are delineated in colour. A key to colours is provided at the bottom left. 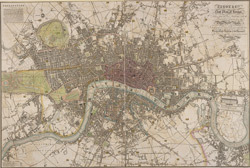 Published in Pigot's 'Metropolis Guide and Book of Reference', the map is divided into circles numbered for reference, showing Waterloo, Vauxhall and Battersea Bridges.